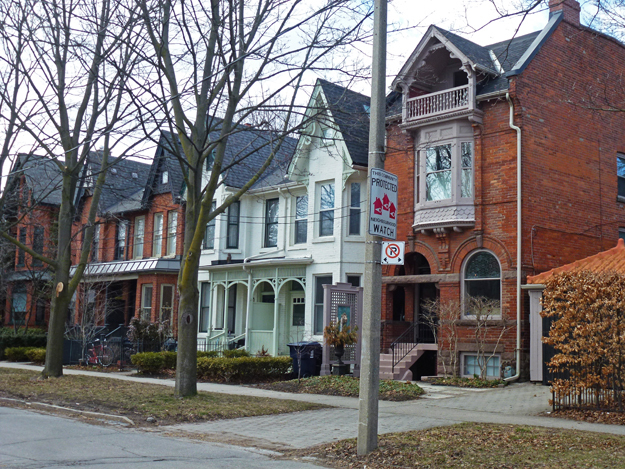 The neighbourhood to the west of U of Toronto and south of the Annex is Harbord Village and it is full of lovely Victorian homes most of which have been renovated and restored. This is the perfect time of year to see them before all of the leaves come out on the trees. I've been inside a couple of the ones on this street and they are wonderful. This looks like an ad for the Property Brothers on HGTV or Love It or List It. They are grand old homes but boy some of them need a lot of work! :) Nice shot, Pat! Which one is yours? One more thing: We see young couples, they look like they're still in their teens with a baby and they're buying houses costing anywhere from $800K to over a million bucks. Where do they get the money? Do jobs pay that much more up there? Those are beautiful old homes. They so remind me of growing up in Illinois. they look very familiar to my home town. I bet they're fabulous inside Pat! Lovely bay window in the one closest to us! Like the Victorians in West Philadelphia where we all played and grew back in the day. Visits to Toronto seemed visits to a sister outpost. A nice looking neighborhood. The houses look to be in wonderful condition. Thinking about buying one of these beauties, Pat? If I could, I'd select the white one! Lovely homes. You are right about the time of year of when to photograph. A fine neighborhood. Personally I like a bit more space between my neighbors and me, but that is just a personal thing.